Welcome to USA’s most detailed weekly ad preview site. In this website you are gonna find latest updates of all weekly ads. Most popular brands of grocery, electronic and pharmacy stores are here such as Albertsons, CVS, Frys, Kroger, Publix, Ralphs, Target and Walmart. All these brands publish their ads weekly and we are reviewing latest products and special offers. Stay tuned for all weekly ads. Do you need fresh food, wine, meat, soft drink, seafood, chips or diaper? Here comes new Fry’s Catalogue ’s half price and Bogo deals which are valid until 29 January. Mix and Match offer is one of the most popular deals in all categories. When you buy 6 you can save $3,00. Also, remember to use your online coupons and get more savings. The Succesful brand Simple Truth gives over $100 saving in digital coupons. Let's look into some of the offerings. Cereals, soft drinks, and chips on page 1 have mix and match deal. If you buy 6 you can save $3,00. Also, there are lots of items on this category such as Philadelphia cream cheese, Halo top ice cream, Kraft natural cheese, Kroger cheese, Ocean spray juice, Jacksonville breakfast sausage, Ballpark buns, Farmland bacon and more. There are 4 items that you might want to consider. Dole Salad kits have Buy 1 Get 1 Free, Fresh Foster Farms Boneless Chicken Breasts have buy 1 Get 2 Free, Arm &Hammer Detergent has Buy 1 Get 1 Free, and Nature Way Vitamins have Buy 1 Get 1 Free deals. 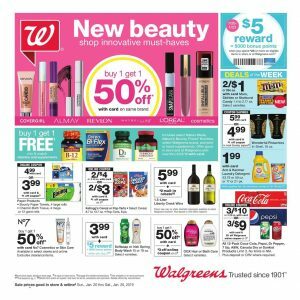 Let's review the latest Walgreens Weekly Ad Deals Jan 20 - 26, 2019. Ladies are lucky this week as there is a huge discount on beauty products and makeup. Catch the chance of getting 50% discount for second product you buy through beauty brands like Revlon, Cover Girl, Almay, Loreal. Shampoos, body washes, lady products and many more things are buy 1 get 1 50% OFF. How about mac and cheese for dinner? You can get 2 for only $6 this week. Also take a look at meals made easy on page 2. Crackers, snacks, chips, chocolate and all other threats are on sale if you want to make a little sin after work. Beverages are ideal to stock up indeed. Don't forget Valentine's day, it's not too far. You can find gifts for love on page 2 and buy your gift to your loved one without spending a fortune. Real love is more important than value at the end of the day. Fresh and clean guys, here are the best offers to keep your house clean and fresh. All household items are on sale now to give you the chance to buy more and save more. Health and beauty essentials come with a wide range of products and many of them buy 1 get 1 50% OFF. If you have prescriptions, you can get your pills from Walgreens with low prices. Also vitamins and other daily health items can be found in drug section Medicare. Protein mixes, wheys and other fitness helpers are available too. Save up to $5 on each Medicare part D prescription now. Finally, get your photo prints, enlargements and canvas options from the photo section and check out Duracell batteries and other needs via page 13. 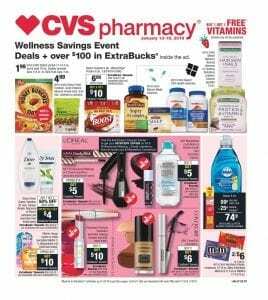 New CVS Weekly Ad Deals 13-19 January Pharmacy Catalogue is available now with BOGO deals, and over $100 extra bucks deals. If you are concerned about your health you can check a wide range of vitamins in this catalogue. So there are lots of brands that offer you vitamins for your immunity, heart and bones. Here are some healthcare items. Now don’t put your pen down we are continuing your shopping list with the Extra Bucks deals. In CVS Weekly Ad 13-19 January Pharmacy, you will find out over $100 extra buck deals. You can enjoy your shopping and be peaceful about saving money. Because Loreal Cosmetics, Gilette razors, New Chapter Booster Power, Garden Of Life Protein Power, Formula for your baby, Depend or Poise pads offer you premium quality and affordable prices. Let’s check some of the good picks. Above all there are diffent kinds of deals are in this catalogue like Buy 2 get 3 rd Free. 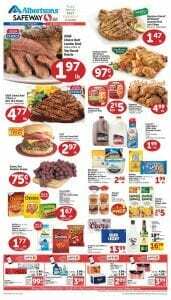 Finally CVS Weekly Ad 13-19 January Pharmacy offers you great deals. For that reason don't forget to stop by CVS stores for a great save.